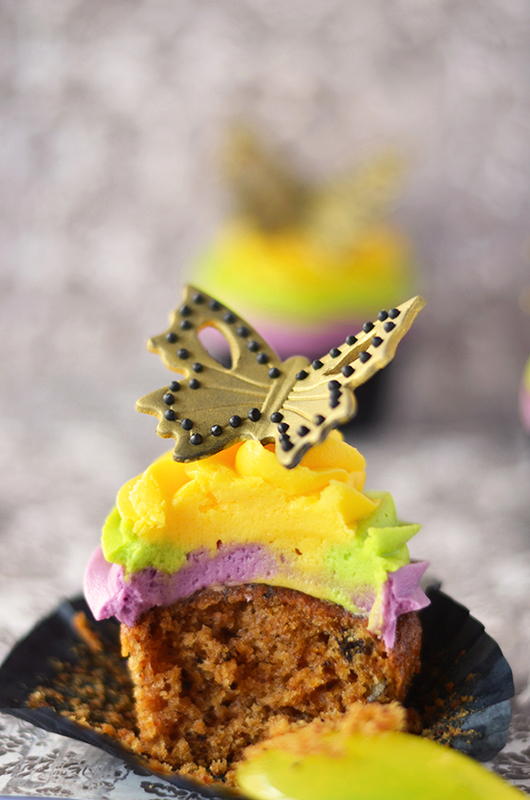 Ivana from CupcakesDiario combined the best of several recipes to bring us the ultimate in carrot cupcakes. Ivanna is an amazing cupcake decorator and offers cupcake decorating courses for those who are looking for tips. The catch? You’re gonna have to be in Barcelona, Spain, to learn from the master baker herself. Beat the eggs and sugar for 2-3 minutes. Add olive oil until the mixture is homogeneous. Sift the flour, cinnamon, baking powder, baking soda and salt. Add it to the mixture slowly until blended completely. Add fruits and coconut to the batter. Mix thoroughly with a spatula. Capsules Fill cupcakes 2/3 full and bake at about 180 degrees for about 20 minutes, or until a skewer pierced with comes out clean and dry. Remove from oven and let cool in the same pan for 4-5 minutes. Then remove from pan and let cool completely on wire rack. With the mixer rods very cold, whip the cream with the firm about gelespessa teaspoon (xanthan gum-stabilizer). Let stand. Add the cream cheese (remove excess fluid from the container before adding the cream) and continue beating until the mixture emulsifies and be much smoother. Add the cream and mix thoroughly with a spatula. In three separate cream bowls and each dye to achieve the desired colors. In this case, I mixed the dark purple grape violet and claret , so I mixed the green gooseberry and electric green and yellow I put just a little bit of yellow primrose . For decoration I dyed Satin Ice gum paste dye Extra sugarflair black and I used the largest cutter with ejector cutters set of butterflies . With a cutter I made ​​the holes of my imaginary masks. I makeup black butterflies with golden sands dye Rainbow Dust and done a mini black beads with royal icing .